In the developing process of Messente’s platform we have taken into account that using Messente has to be extremely simple. 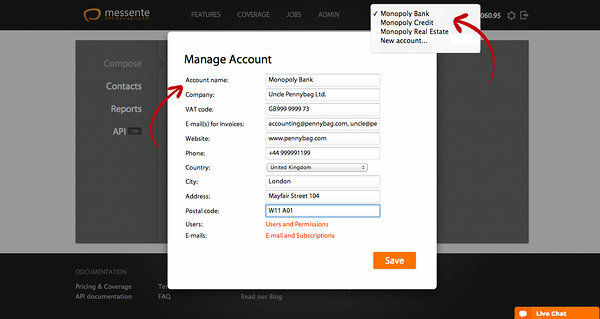 While activating the API connection, managing the delivery information, and many more actions can be done with no hassle, we have made it simple to manage your account as well. First things first, to make changes on your account, click the “gear” icon you can see at the upper-right corner on the web interface. By clicking this a window opens with adjustable information. 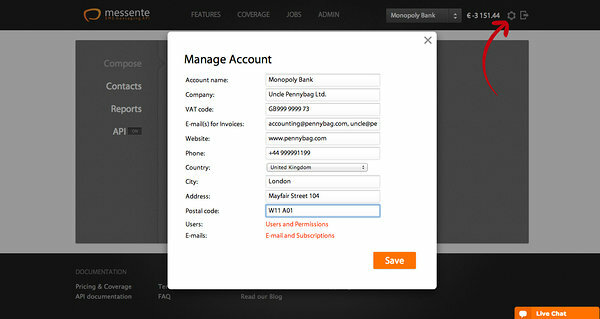 First information gap you will see is the current account name you are using. This makes it easier to switch between multiple accounts. Based on how Messente’s platform is being used, we have divided the users into two groups: “Account Administrators” and “Senders“. While the “Administrator” has the permission to do all the necessary changes, the “Sender” is able to use the web interface for sending out messages only. 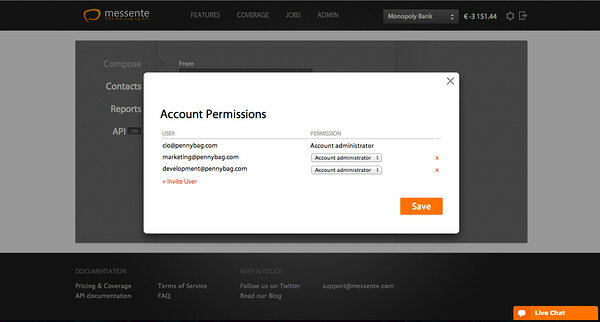 Adding new users: can be done by “Administrator” by clicking the “Users and Permissions” link at the “Manage account” window. There you can see all the listed emails and their level of permission. The drop down menu at “Permission” column allows you to change the role of users. Inviting new users: can be done by clicking “+ Invite User“. Choose their level of permission and click “Invite“. The invitation will be sent to the inserted email address. 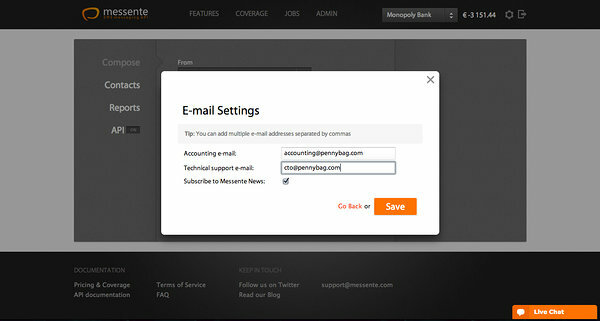 Deleting existing users: behind the user emails at “account permissions” you can see a small “x” that removes the user from Messente’s platform. Accounting email and technical support emails should be provided for any cases that might need quick contact. NB! All the information you provide on your company’s account is well protected and not available to third parties. From behalf of Messente we do everything what is necessary to keep our client’s information secure.